Morcon is another special Pinoy dish usually served only on special occasion and during this holiday season. 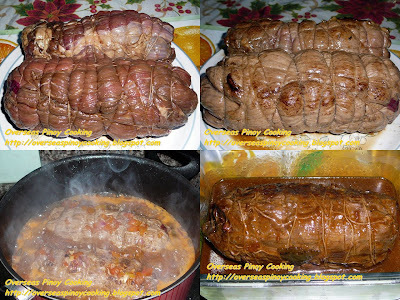 Ideally the beef slice should be from the eye round cut of the beef, but other parts of the beef could be used as long as you could manage to have a sufficient sheet to form a beef roll. On this post I used 2 whole eggs for my filling, should you find it difficult to manage a big roll the egg could be cut into wedges to form a smaller roll. Another feature of my version is the way I stewed the morcon roll. I use a lot of tomatoes and onions and stew it mechado style. I then filter out the solid residue on the remaining broth after stewing and finally thickening it to form a more consistent tangy sauce. Enjoy. Ask the butcher to cut beef morcon style, it should come as 1 whole sheet about 1/2” thickness. Cut into 2 portions to make 2. Marinate beef in kalamansi and soy sauce overnight. Remove from marinade, spread out beef in a big platter season with salt. 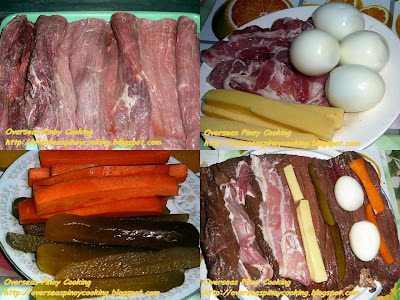 Arrange 2 whole eggs, 2 slices of bacon, strips of sweet pickles, carrots and cheese. Roll neatly and tie with string to form a big log. Repeat process on the second roll. Brown all side of each morcon roll in a big skillet, keep aside. Sautee garlic, onion and tomato in a big sauce pan. Add in tomato sauce, peppercorns, bay leaf, left over marinade and 4 cups of water. Bring to a boil, now add in morcon roll and simmer in low to medium heat for 2 hours or until the broth has reduced to half. Remove morcon roll from the pan and keep aside. Filter out the solid parts of the remaining broth. Thicken with cornstarch diluted in 1/4 cup of water, stir cook for a minute to form a thick sauce. Carefully remove string on the morcon roll, slice crosswise and arrange in a platter. Pour sauce over and serve.